A multination consortium in Europe has invited Korea to join its high-end jet production project in an apparent attempt to win what would be Korea’s biggest arms-procurement deal. The move came following Seoul’s announcement that it would purchase 60 advanced fighter aircraft in line with its push to shift the country’s military posture from passive defense to proactive deterrence with a projected budget of up to 10 trillion won ($8.96 billion). “We welcome the Korean industry to participate as EADS’s full member,” Erwin Obermeier, a senior advisor of export projects at EADS, said at the International Conference for Air and Space Power held downtown Seoul last week. 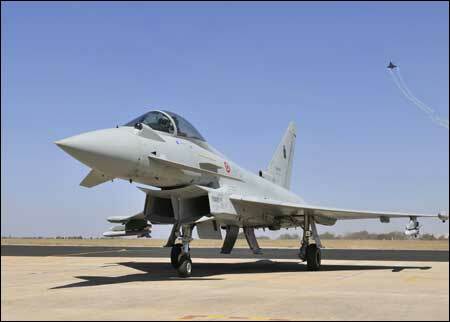 EADS, or European Aeronautic Defense and Space, is a multi-national consortium from Germany, UK, Spain and Italy. The largest aerospace and defense contractor in Europe reportedly offered a better deal in Korea’s last jet acquisition project in 2008 than its American competitor Boeing, but lost the bid due largely to political decisions. Obermeier underlined that EADS’s Eurofighter program will offer a unique potential for the Korean industry to access the global market. “The Eurofighter program is jointly owned, developed, produced, and delivered by all four European companies,” he said, suggesting that Korea will also have much to benefit by joining the consortium. He said if Korea chooses EADS’s Eurofighter Typhoon, which can fly at a maximum supercruise speed of Mach 2, his company will offer Korea the chance to assemble and partly manufacture the advanced jets in Korea. “The first 10 deliveries will be assembled in Europe, but the next 24 will be built with components manufactured in Korea,” he said, adding that the remainder will be assembled here. He also downplayed concerns over compatibility, saying all Korean fighters and Eurofighters are built to be inter-operable in the NATO environment. Korea has purchased 60 of the F-15s from Boeing, which won both the FX-I and II projects in 2002 and 2008. Boeing claims that it offers the most cost-effective solution and a close partnership with Korean firms. Roger L. Besancenez, vice president of the F-15 program for Boeing Defense, Space and Security, says his company has worked with 22 Korean companies, including Korea Airspace Industries, Korean Air, LIG Nex1 and Huneed Technologies. Boeing has announced that it will enter the FX race in Korea with F-15 Silent Eagle, a semi-stealth fighter. He also noted that Boeing’s SE can carry the heaviest payloads and widest variety of integrated weapons of the aircraft available in the market. During the forum, Lockheed Martin dispelled growing criticism that it is trying to dump the first batch of F-35s fitted with only the bare minimum capabilities on Korea at an exorbitant price. It claimed that the U.S. Air Force, which has the highest level of classified data about all high-end aircraft have chosen its F-35 over the F-15, F-16 and other jets because it judged the fourth generation fighters have reached their peak performance and they need another level of capabilities. The Korean Air Force is seeking to purchase up to 60 advanced combat fighters. The F-35A Lighting II is known as the only fifth-generation stealth fighter available on the market, but critics say that it has yet to prove its capabilities and may pose a risk, requiring high maintenance costs.